Student writer, living in leeds. Since I've been at Leeds the O2 has never disappointed. Throughout my teenage life I have always been a fan of the O2 Academies, however I've usually had to visit Birmingham or Leicester to see bands I desperately wanted to see. The prospect of a new O2 Academy right on my doorstep to experience live, and review, was very exciting to me. image from O2 Academy Facebook page. 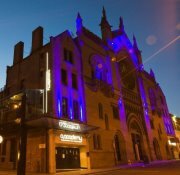 Since I've been in Leeds I have discovered that not only does the O2 Academy serve as a popular gig venue, but also as a place where the best clubnights are held. Vodka Nationwide always proves to be an exceptionally good Wednesday night featuring a mixture of music ranging from chart show to pure cheese (last time there was even a bouncy castle bobbing about).yet it always seems to end with those oh so catchy indie classics. You may be thinking that as an O2 Academy event it surely must be outrageously priced, but with a cheap entrance fee and ridiculously reasonable drinks it usually turns out to be a memorable (or not so memorable) night. One word of advice would be to just try to avoid losing your group, because if you're left searching the many, many floors of this place by yourself, you will be disorientated, bewildered and baffled until the end of time. Or until you're found. The former is more likely.